Until the publication of this remarkable new work, no single source could be used to identify and locate the records of the various countries of the Western Hemisphere. Given the extent and diversity of the records, this is hardly surprising; and yet the creation of such a source is precisely the task Christina Schaefer set herself. 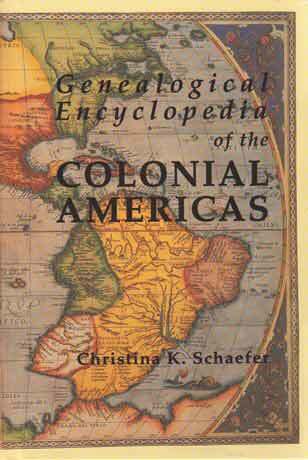 The immense body of records of the colonial period in the Western Hemisphere presents a serious challenge to the researcher – in some cases even a stumbling block--and therefore in this work Mrs. Schaefer has undertaken a systematic examination of the records to show the researcher where to find the most important genealogical records of the period and how to access them, all within the framework of a single encyclopedic volume. Equally important, she has defined the various classes of records in each country, identified as many of them as is practicable in a book of this size, provided historical background and brief sketches of the records themselves, added a description of the principal holdings of the major repositories of each country, and has interwoven selected reading lists throughout. The reader will appreciate, of course, that the subject matter is vast, covering the colonial records of all the Americas, from Latin America to the Caribbean, from the original Thirteen Colonies to Canada and New France, so of necessity the author has been at pains to be as comprehensive as possible. In the end, she has put together a magnificent reference work, one that will guide all researchers, beginners and professionals alike, to the most direct and reliable route to the colonial records of the Western Hemisphere. The scope of the work covers the period of colonial history from the beginning of European colonization in the Western Hemisphere up to the time of the American Revolution, and the records described are the primary records used in genealogical research. However, the time line has been extended to provide more complete information in the following instances: U.S. states other than the Thirteen Colonies with records that begin prior to the Revolutionary War, until such time as they became part of the U.S. (possession, territory, state); Latin American countries, which did not declare their independence from Spain and Portugal until 1808 and later Canada through about 1841; Caribbean countries and dependencies to about 1810; The subject of slavery up to the abolition of the slave trade. While the best sources of information regarding an immigrant ancestor can usually be found in the country to which he immigrated, there are, nevertheless, many important records still to be found in the country of origin--records which had either remained in the mother country or had been returned to the mother country: church records, for example, emigration and trade company records, indenture agreements, military records, missionary society records, probate records and wills, provincial land grants, and tax records. Thus the last section of this book provides information regarding the location of colonial records in such countries as Denmark, England, France, Germany, the Netherlands, Portugal, Scotland, Spain, and Switzerland, and at the Library of Congress in Washington, D.C. The range of the book is so remarkable that even the most seasoned researcher will find it breathtaking. What follows is a listing of the contents of the seven distinct parts that make up the whole. From this itemization the reader can draw his own conclusions about the value of the work as an indispensable desk reference: Chronology of colonial history and dates of first colonial governors, Colonies of Latin America arranged according to mother country, Colonies of the Caribbean, The Thirteen Colonies plus Maine and Vermont, Other U.S. States with settlements prior to the Revolution, Canada, and Resources for further research, including the location of colonial records in such countries as Denmark, England, France, Germany, the Netherlands, Portugal, Scotland, Spain, and Switzerland, and at the Library of Congress in Washington, D.C.